Slate removal involves using a specially designed blade combined with vibration from a jackhammer to get underneath the tiles and screed separating them from the sub floor. 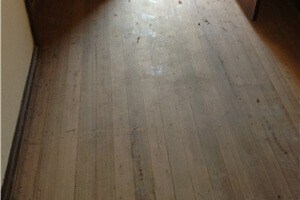 All Stripped use this process to remove slate flooring off concrete, yellow tongue and timber floorboards. Screed is a mix of sand and cement and is used primarily to create a level bed to lay slate tiles on. Screed can be anything from 20-100mm thick. 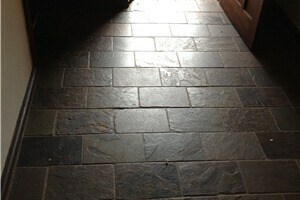 Most Slate, Terracotta or Marble tiles are laid on screed. The process of removing tiles on screed is much the same as basic tile removal however the process takes longer is much more labour intensive and produces a lot more rubble. Not all Slate flooring is laid on a screed, in some cases if you have a timber sub floor the slate may be stuck directly to the sub floor with out any screed. In this case the job becomes much harder and more labour intensive as the slate tiles and glue bond very well to the timber sub floor and the removal process may damage the timber sub floor. Why choose All Stripped – All Stripped has been an industry leader in slate removal for almost 15 years. Our processes have been designed to be very effective and efficient whilst maintaining superior workmanship and service. This makes All Stripped ideal for commercial and domestic jobs with tight deadlines. All Stripped remove all rubble and waste material and use industrial vacuums, dust extraction fans and drop sheets to control and minimise the spread of dust. 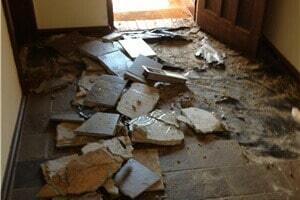 Providing a vacuum finish and a clean worksite ready to continue with your renovation.